I had an unexpected reboot during the last update (which I was doing in the desktop environment and not a TTY, I didn’t knew about that before). After rebooting the system and continued the update, I noticed that there was a problem with the XFCE panel: some icons had reverted to another theme, and there was no way to change them back. When I minimize/maximize windows, the panels appear to be killed and restarted. If I do it too fast or too many times (I’m not sure which option) the panels stay dead. I tried another full system reinstall from a TTY, but the problems persist. After looking a bit more in depth in the update I’m not sure if the problem was caused by the reboot or by the update to XFCE itself. I’m considering just formatting the system (I had just formatted it a few weeks ago), but if it’s an issue with XFCE I fear it may reappear. EDIT: I have found this post with a similar issue. The command as stated there doesn’t work for me, but I’m looking for a way to try that downgrade. Have you installed the package downgrade ? I also got the same warning, but I had xfce4-panel-gtk3-4.13.3-11 in my cache, and appeared as option 2, which I selected. Maybe you need to get hold of xfce4-panel-gtk3-4.13.3-11 and install it, but you will need to ask someone more experienced to help with that. Good luck with it. If you feel you absolutely need to use downgrade then temporarily swap to testing branch. It is a hack but will allow its usage. Maybe try this, swich to testing, downgrade just the one package and switch back to stable. Obviously, there are risks to breaking your install by doing so… have a backup or plan B. !! When I minimize/maximize windows, the panels appear to be killed and restarted. Yepp, same issue here. There was just an update to xfce4-panel-gtk3 4.13.3-15 in the testing branch. Seems that one fixes the issue. Sorry for the mess. xfce4-panel-gtk3 4.13.3-15 should fix the issue. Now also pushed to stable branch. Does that package need to be in the cache for that to work ? Thanks moson and philm, got it sorted now. 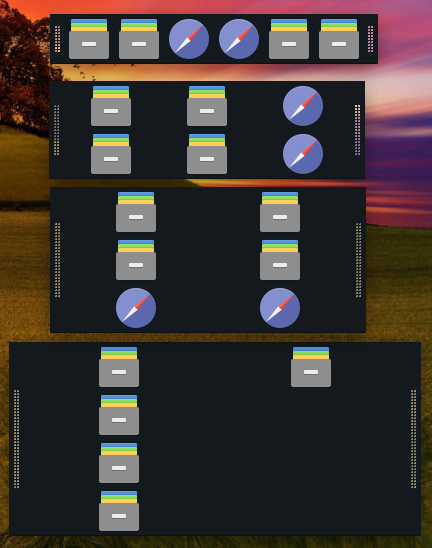 However, the launcher icons occupying extra space when there are extra rows in the panel persists. Should I open another post to discuss/report that? I thought at first it was only me because of the reboot, but I’m starting to think it may be another bug (haven’t been able to find a way to downgrade it yet). 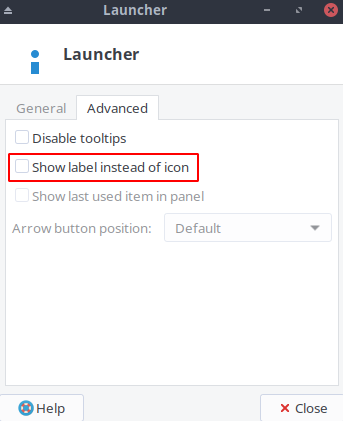 Sounds weird, but you can fix that by going to the launcher properties and toggle the “Show label instead of icon” switch (turn on and off again). Afterwards the specific launcher should occupy less space. You’d have to do that with all your launchers though. I did that before the xfce4-panel-gtk3 4.13.3-15 update, but they ended up reverting to the size. The ones from the example picture were created after the update just to test it. I will still give it a try, I’ll edit this if they revert or stay after a while. EDIT: They reverted to occupy extra space after a shutdown. Sorry for the dumb question - but how can I upgrade to this version? I have exactly the described problem (panel restart and crashes) with the installed version xfce4-panel-gtk3 4.13.3.14 and wanted to upgrade to xfce4-panel-gtk3 4.13.3-15 but with sudo pacman -Sy xfce4-panel-gtk3 I am told everything is up to date. Do I have to change the installation source? Where should I read to learn these basics? how can I upgrade to this version? Thank you very much - I didn’t know about the pool/overlay (amongst many other things).